Lake George | Capital Region of New York Real Estate :: 518Realty.com Inc.
Lake George, nicknamed the Queen of American Lakes, is a long, narrow oligotrophic lake located at the southeast base of the Adirondack Mountains , in the northeastern portion of the U.S. state of New York . It lies within the upper region of the Great Appalachian Valley and drains northward into Lake Champlain and the St. Lawrence River drainage basin . The lake is situated along the historical natural (Amerindian ) path between the valley of the Hudson River and that of the St. Lawrence, so lies on the direct land route between Albany, New York and Montreal, Canada . The lake extends about 32.2 mi on a north-south axis, is quite deep, and varies from 1 to 3 miles in width, presenting a significant barrier to east-west travel. Although the year-round population of the Lake George region is relatively small, the summertime population can swell to over 50,000 residents, many in the Village of Lake George region at the southern end of the lake. Lake George drains into Lake Champlain to its north through a short stream, the La Chute River , with many falls and rapids, dropping about 230 feet in its 3½-mile course-virtually all of which is within the lands of Ticonderoga, New York and near the site of the famous Fort Ticonderoga . Ultimately the waters flowing via the 106-mile-long Richelieu River empty into the St. Lawrence River downstream and northeast of Montreal and then into the North Atlantic Ocean above Nova Scotia . 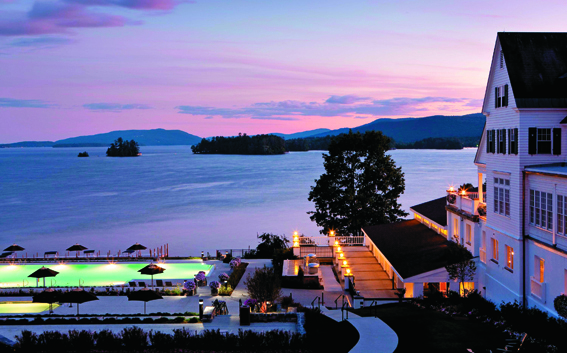 Lake George is accessible by car via Interstate 87 and by air from Albany International Airport , which is about 45 miles (72 km) away. Today, Lake George remains a tourist destination, resort center, and summer colony . A popular activity in the Lake George area is hot air ballooning. One of the nation’s oldest gathering of hot air balloons occurs every September in nearby Glens Falls, NY.